Build a simple mission-style wall shelf. 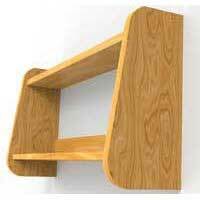 Click here for detailed wall shelf plans. 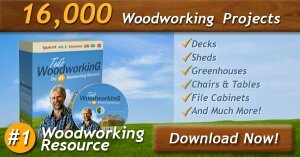 Coarse-grained woods make up into furniture and take a more satisfactory finish than close-grained woods. 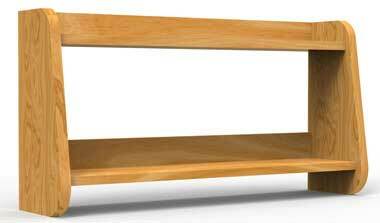 For this reason chestnut or oak is suggested for this shelf. Chestnut has a beautiful grain and is soft and easily worked. 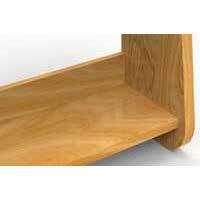 Sides, 2 pieces, 3/4 by 7-1/4 by 16-1/2 in., S-2-S.
Lower shelf, 1 piece, 3/4 by 6-1/4 by 30-1/2 in., S-2-S.
Upper shelf, 1 piece, 3/4 by 4-3/4 by 30-1/2 in., S-2-S.
Lower back, 1 piece, 3/8 by 3-1/2 by 30-1/2 in., S-2-S.
Upper back, 1 piece, 3/8 by 3 by 30-1/2 in., S-2-S. In making out this stock bill the pieces have been specified 1/4 in. wider and 1/2 in, longer than the finished piece is to be to allow for squaring up. The thicknesses are specified mill-planed exact so that all that is necessary is to merely plane off the mill-marks from the two broad surfaces. Begin work by squaring the horizontals to size. They are to be all of the same length. Next shape up the end pieces. The amount of slope for the front edges is indicated on the drawing. After all these pieces have been squared up and the mill-marks removed, the dadoes or grooves and gains may be laid out and cut. Be sure to remove all the mill-marks off before putting on any finish. When boards are planed at the mill the planing is done by means of two or four knives revolving above or below the board—sometimes both above and below at the same time. These knives leave the surfaces filled with little ridges and hollows across the grain. These hollows, though they are hardly visible to the eye on the unfinished surface, show up as ugly streaks upon the surface after it has had a finish of stain and filler applied. There are several ways of fastening the parts. They may be fastened by means of round-head blued screws. They may be fastened with carriage screws. The one in the illustration was put together with ordinary wire nails and the heads of these covered with ornamental heads to represent old-fashioned hand-wrought nails. 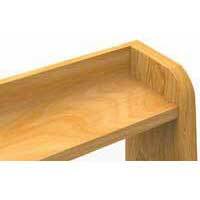 It will be found easier to apply the finish of stain and filler before the parts are assembled. 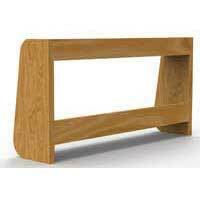 The wall shelf can be finished in any one of the many mission stains avaiable.